Thank you, we greatly appreciate your consideration and donation to Habitat for Humanity’s ReStores! Your donation helps fund our building affordable homes for families in need and is tax deductible. Schedule a free donation pick up! We accept clean appliances that are less than 15 years old and in 100% working order with no missing parts. Please include owners manuals if you have them, as they add value to your donation. We also accept unique antique appliances in working order. Undamaged, sellable art and decor. Hard back and unique, best selling soft covers, cookbooks, interior design, and antique collections. Building materials in good condition. No chemicals. We take undamaged cabinets, complete sets. They must have doors, shelving, display racks, etc. We accept solid, core interior/exterior doors in good condition. Please leave them in the jambs, if possible. Please no holes, cracks, rot, etc. We accept flat panel TVs (less than 10 years old), amps, receivers, speakers and wiring, remote controls, working GPS units, automotive electronics, video game systems, CD players, radios, and stereos. No printers, faxes, or incomplete computers / password protected computers or units older than Windows Vista. No incomplete systems, cell phones, cordless phones, CRT TVs, and tape players. Computer monitors accepted with our discretion. We accept tile (20 sq. ft. or larger), marble, and hardwood/laminate flooring (100 sq. ft. or larger). We accept functioning, furniture in good condition. Please no stains, rips, or tears in upholstery. If the item was around pets, please vacuum before donating. Chip-free, safe, clean, complete sets preferred. We accept lamps, light fixtures, chandeliers in working condition with all hardware included. No ballasts with pcb’s. No ceiling fans. We accept full and half sheets of plywood. We accept full length lumber (8 ft. long minimum). We will accept trim in smaller pieces, but not less than 4 ft. long. Please remove nails. No rot, mold, or twisted lumber. We accept containers of latex only paint for a $1 nominal fee. Note- you can take up to 5 gallons to ACE Hardware in Carbondale and Sherwin Williams in Glenwood Springs for free. We cannot take oil based paints or stains or other toxic/hazardous substances, (i.e. pesticides, powders, paint thinners, or other chemicals). We so not accept opened paint but paintcare.org has a locator map for recycling centers. Wallpaper is taken in full unopened rolls. We accept 4 ft. or longer pipe in a wide range of material. We accept fiberglass tubs, sinks, and commodes that are white or cream. They must be dog-friendly clean. Cast iron sinks and bathtubs, not chipped. We accept all types of roofing material such as rolled, metal, and bundles of new shingles. We also accept roofing gutter/canale materials that are in full pieces (min. 6 ft), not rusty, bent, or damaged. Stain free, rip free, clean, sellable, rugs. Sporting goods in good, operable condition. No exercise machinery older than 10 years. We accept hand and power tools in working condition. No battery powered tools, unless they are newer than 10 years with functioning batteries and charger. We accept double pane windows of all types if the glass is intact. We take stained glass windows. If they are casement type windows, we appreciate having the hardware and cranks. No screens by themselves, must be included with window. No delaminated windows and no unframed glass whatsoever. Sometimes it is difficult to categorize unique donations, such as pianos, antique items, carosel horses, etc. If you have an item you’d like to donate, but you’re unsure we will take, please give us a call at 945-7733! 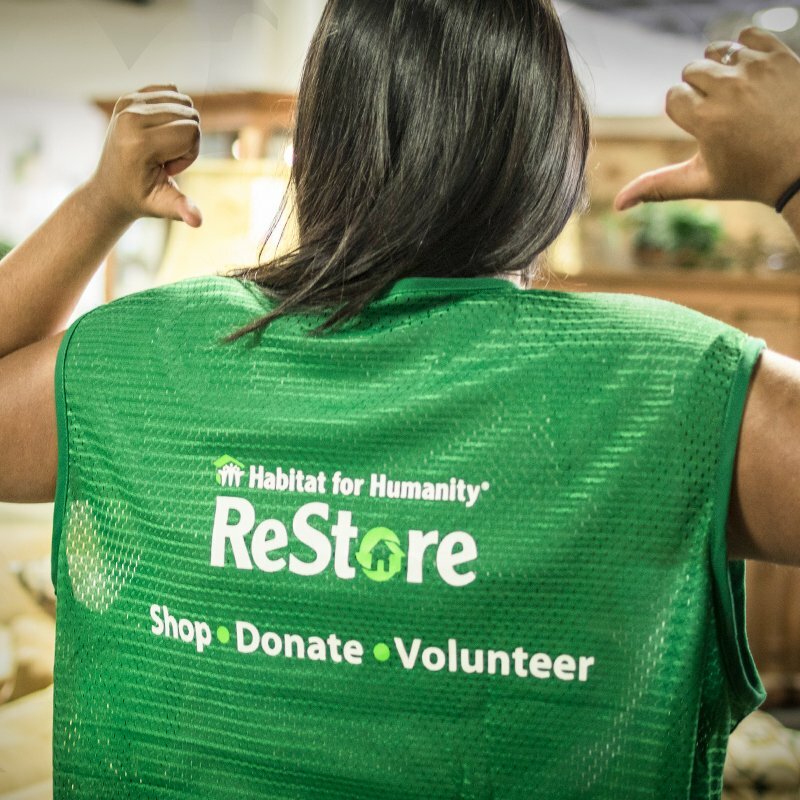 Our ReStore staff is ready and excited to answer your questions! Printers, faxes, or incomplete computers / password protected computers or units older than Windows Vista. No incomplete systems, cell phones, cordless phones, CRT TVs, and tape players. Computer monitors accepted with our discretion.